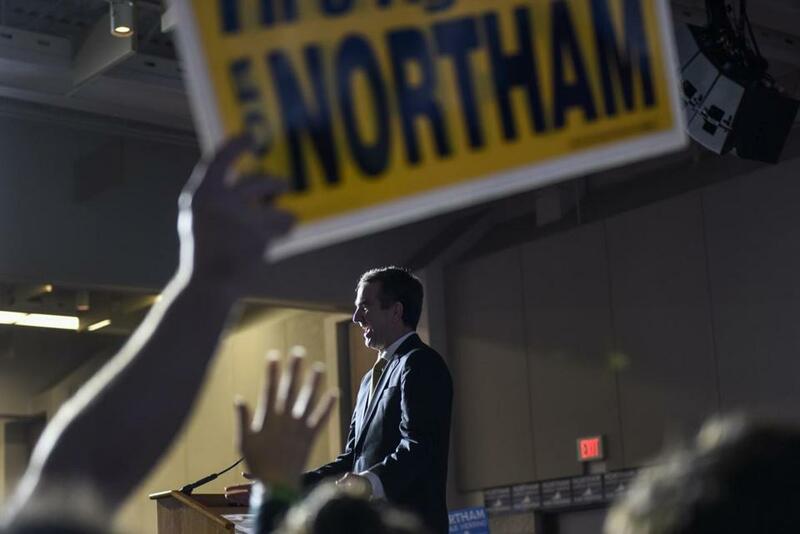 Virginia governor-elect Ralph Northam addresses supporters Tuesday at George Mason University in Fairfax, VA.
For the past year Democrats have been desperately searching for a reason to be hopeful about their political future. They finally got it Tuesday night — with electoral wins across the country that surpassed even their most optimistic expectations. The big story of the evening was of course the Virginia gubernatorial race. In recent weeks, Democrats have been having a collective meltdown over the possibility that the state’s lieutenant governor, Ralph Northam, would fail to defeat former Washington, D.C., lobbyist Ed Gillespie. 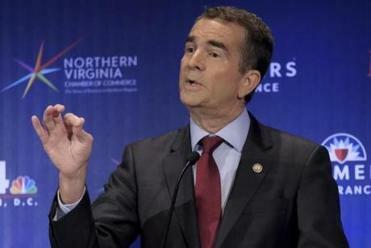 But not only did Northam emerge victorious, he did so in convincing fashion, winning by 9 points, the largest margin of victory in a Virginia governor’s race since 1985. Democrats also won the lieutenant governorship, the attorney general’s office, and in perhaps the most shocking result of the night, may take control of the state’s House of Delegates. While the results in Virginia were heartening for Democrats, the real story is the broad scope of Democratic gains. In New Jersey, Democrat Phil Murphy easily took back the governor’s mansion after eight years of Chris Christie’s disastrous stewardship. In Washington state, Democrats flipped control of the state legislature. In Maine, a referendum to expand Medicaid passed handily. Democrats won local races in Michigan, Georgia, and New Hampshire. This wasn’t a Democratic wave; it was a tsunami. There isn’t much mystery as to why this happened: Donald J. Trump. Trump’s approval ratings are historically low, but beyond the numbers, Trump is despised in a way that few politicians have been disliked in American history. The number of Americans who strongly disapprove of Trump hovers around 50 percent. These are voters who have clearly made up their mind about the president and they are the ones who drove Tuesday’s trouncing of Republicans. Democrats win key races for governor in N.J., Va.
Ralph Northam won Virginia’s governor’s race over Republican Ed Gillespie, and in New Jersey Phil Murphy overcame Republican Kim Guadagno. With the albatross of Trump around the neck of Republicans, one almost has to consider the Democrats to be favorites to win back the House of Representatives next fall. Even before the evening was over, two prominent Republicans announced their intention not to run for reelection. One should expect that those numbers will rise in the next few days. Indeed, as bad as the election results were for Republicans, how they lost is what really should terrify party leaders. In Virginia, Gillespie sought to imitate Trump’s 2016 campaign by jumping with two feet into the political gutter. Late in the race and trailing in the polls, he began running ads boasting of his intention to keep Confederate statues in place. He tried to play on fear of undocumented immigrants by raising the specter of sanctuary cities and the MS-13 gang. Unable to win on the merits or by utilizing a positive message, Gillespie became a culture warrior. And it failed spectacularly. Indeed, according to exit polling, Northam crushed him among voters who decided their vote in the week before the election. If Republicans can’t energize their voters by playing on the usual conservative bugaboos of immigrants, crime, and permissive liberals, then what hope do they have of maintain control of the House next year? After the GOP’s debacle to repeal and replace Obamacare, it seems pretty clear who has the upper hand on health care. If voters want a more populist agenda from Washington, it’s hard to see how passing a massive tax cut that disproportionately benefits the rich is going to be a boon for Republicans next year. However, failure to do anything on taxes has the potential to prove disastrous as well. Quite simply, Republicans are facing a choice of bad and worse, with no guarantee that if they decide to make tax cuts a priority they can even coalesce around a plan that can pass both houses of Congress. In the mind of Trump he cannot fail. He can only be failed. Of course, Republicans have no one to blame but themselves. When, in the pursuit of short-term expediency, you make a Faustian bargain with a narcissistic and unhinged man-child and make him your political leader, it does eventually come back to haunt you. Tuesday night the political chickens came home to the roost, and it’s probably just the beginning for Republicans.